Harrison – ” the show must go on” – Three Dog Night, Queen. “must the show go on” – Pink Floyd from The Wall. 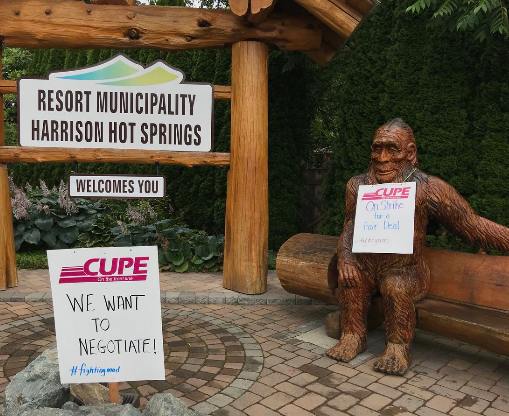 JULY 11 8PM UPDATE – CUPE Local 458 posted on Twitter that they and the Village of Harrison Springs resumed negotiations July 11, however after a brief bargaining session no agreement was reached. Worthylake says that as a show of good faith the union has agreed to stop all picketing affecting the Arts Festival until the two parties meet again at 9 a.m. on Saturday July 14, but that strike action will continue at other municipal worksites in the meantime. However, the union remains prepared to bargain throughout the week should the Village be able to find time to resume negotiations sooner. JULY 11 – 1PM UPDATE – Bryan Cutler with the Festival says that CUPE 458 has told Festival Organizers that while talks are ongoing, the Festival shows will not be affected. For show information, click the Harrison Festival of the Arts link. JULY 11 ORIGINAL STORY – After an auspicious start to the 40th Anniversary of the Harrison Festival of the Arts and an SRO from Buffy Saint-Marie, the Festival ran into speed bumps. There is a labour dispute between CUPE Village workers and management. This forced a quick move of the Monday night performance of spoken word performer Shane Koyczan. Due to a labour dispute between Village workers and management, a picket line has been set around the perimeter of the Harrison Memorial Hall. The show this evening at 8:30pm with Shane Koyczan will go on!!!! But at the St. Alice Hall located only a few blocks west, right next to the Harrison Resort Hotel. We are sorry to report the inconvenience, however to make things far less complicated, the Festival has decided that this would be the best solution for all. So far no other shows have been affected and the performance from Chilliwack on July 15 is another SRO. No word if there are any changes there. For the record, Koyczan is a union supporter and didn’t want to cross Monday’s picket line. CUPE 458 vice president Darlene Worthylake says they want to get to the bargaining table and not have any more interruptions of the festival. On their Twitter page, they stated that talks will resume Wednesday July 11 at 2PM. Wages are the main sticking point between the Union and the Village and NOT the festival, who are caught in the middle. CUPE 458 has been without a contract since last October. The festival received Provincial and Federal government grants, so in essence, they have to stay neutral in all of this. CUPE 458 and the Village of Harrison Hot Springs have agreed to resume negotiations at 2 pm tomorrow (July 11). Effective immediately all picketing affecting the Harrison Festival of the Arts will end. We know that it has been challenging for all those involved in the festival and for residents, and that is why we made every effort to find a solution that could allow the Festival to go on. It is our commitment that as long as meaningful negotiations are happening, that the festival will continue uninterrupted. We are optimistic that with both parties back at the bargaining table we will be able to find some common ground and resolve this dispute. The BCGEU is supporting their union cousins. Be the first to comment on "Harrison Festival – The Show Will Go On Despite No Settlement"